You’ve got places to be, and the side of the road isn’t one of them. That’s why Hum gives you 24/‍7 Pinpoint Roadside Assistance. If one of your tires hits a stray nail, smoke is billowing from under the hood, or you’ve just misplaced your keys — Hum can send help to your exact location. Request roadside assistance for flat tires, dead batteries, breakdowns, lockouts, towing, fuel delivery, and more. Roadside service includes up to 4 roadside help requests a year, towing up to 10 miles, and fuel delivery up to 3 gallons where possible. With Hum, I don't have to worry about getting stranded on the road. 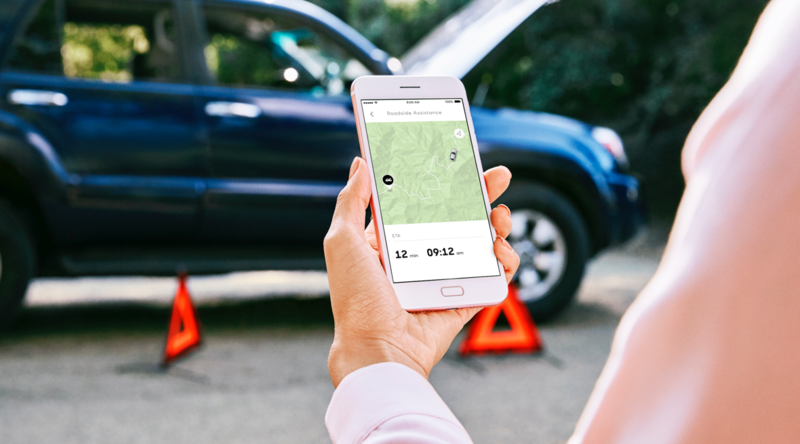 Use the Hum App or call Hum Customer Service to request roadside assistance. If you have a Hum Speaker, use the Blue Icon on your speaker to request help. Pinpoint Roadside Assistance refers only to requests made by calling Hum Customer Service from the Hum Speaker or by calling (800) 711-5800 when the OBD Reader is installed (applicable to Hum&plus; and Hum× only). Hum customers without hardware must use their app or smartphone to request Roadside Assistance. Hum customers can also request via the mobile app to get ETA updates about the RSA service provider. These requests are not “Pinpoint” because they use the phone’s location, and are not tied to the vehicle’s location. What is Pinpoint Roadside Assistance? Through our partner Signature Motor Club, your Hum subscription provides you with push-button access to roadside assistance for a wide range of car problems including flat tires, dead batteries and more. Just press the customer service button on your Hum Speaker. We’ll ping your vehicle to determine its GPS location, and then we’ll contact a Signature Motor Club roadside assistance provider in your area. You can also submit a roadside assistance request using the Hum App, or by calling Hum Customer Service at (800) 711-5800. For more information about roadside assistance, visit www.hum.com/roadside-assistance/. Roadside assistance is subject to the Signature Motor Club terms of service, which are available at www.hum.com/signature-motor-club-terms-of-service/.